Stock Markets are associated with a lot of risk as far as your hard earned money is concerned. Applying a good risk reward ratio strategy is part of your trading plan. If you are a trader or an investor, it implies that you are a risk taker so as to make your wealth grow. Risk management is equally important for you as is wealth growth. An intelligent trader always takes steps to keep his risk at the lowest while maximizing profits. It is by thorough technical research on the stock, using stop losses and maintaining discipline. In fact, when you initiate a trade, your first aim should be to protect your capital and then think of the profits. Risk Reward ratio calculation is such a strategy which helps you limiting your losses in trading and avoiding the undue stress of a trade which is not worth taking. 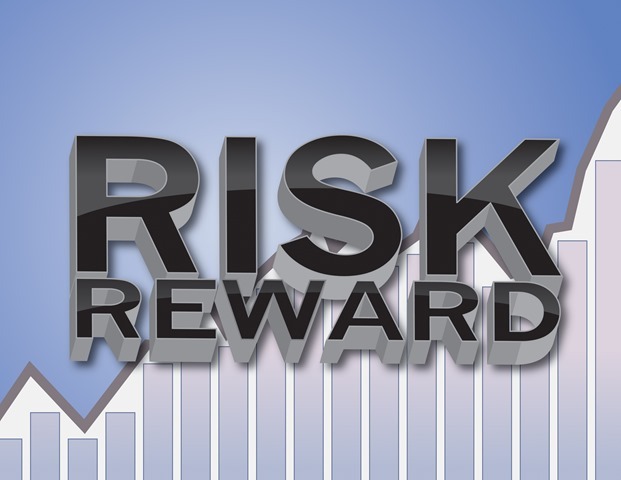 What is Risk Reward Ratio ? Generally speaking, it is the ratio of profits you expect to earn on a trade and the risk you are willing to take to enter that trade. It is the risk reward analysis. Suppose, a stock is trading at $ 100 currently. After doing your technical analysis on the stock, you expect stock to move to $120 in near future. Stop loss for the trade you find at $90. So, by taking a risk of $10, you hope to make $20. Your risk reward ratio comes out to be 2:1. If you expect the stock to move to $140 and keeping a stop loss at $90, you risk reward turns out be 4:1. Now, what is favorable risk reward ratio for you? Well, it varies with individuals and depends on one’s risk taking capacity. Some traders are happy in taking trades where risk reward ratio is 2:1 or even 1:1. But do these trades deserve to be taken? Personally, I never take a trade with ratio of 2:1, leave alone 1:1. Doing trading in stock market is not that easy. It takes a lot of toll of trader, his money, time, skills, emotion control and the stress while he is in the market. Risk starts immediately when your trading order is executed. Hence it becomes necessary that you know about risk management. What you will get from the trade and how much you are risking before you enter the trade. When you trade with ratio of 2:1 or 1:1, you are investing all of your time, stress and emotions. If your trade remains successful, it gives you pleasure but that gets reduced when your broker charges you the brokerage for the trade. At the end, after enduring all this you find that made very little after such a great effort. It would be really great trade if you find a trade with a risk reward ratio of 3:1 or 4:1 or even 5:1. Yes, it is surprising but these trades also exist. All it requires is patience and proper technical work. Markets keep on offering the opportunities, you need to spot them. Don’t waste your time and money in trades with poor risk reward ratios which appear not to be worth trading just for the sake of trading. It happens usually when we are stuck in such a useless trade and are unable to exit while another stock is providing a very good trading opportunity. At the end, a trade with Risk Reward Ratio of 3:1 or above that are always good to trade. Risk is worth taking in such cases. By following this strategy, you would be able to avoid all unnecessary trades and it would also help you in protecting your capital by avoiding undue risk, brokerages and spare you a lot of time. You can utilize that time in relaxing and finding other trades and also finishing your other routine tasks. Apart from the stock trading scene, Risk-Reward ratio calculation should be adopted by every business to determine the level of cost and returns applicable to the business. This approach is just like calculating the cost benefit analysis of businesses. It readily helps in the decision making process!